The following story appeared in Volume 4 Number 7 of the CR News which was published in August 1964. Marquette from the yard on the Houghton side of the bridge that links Hancock. Now three-score years young, the last CR RR passenger coach is still in active service. The valuable relic of a nostalgic era was leased for the summer season to the Lake Superior and Ishpeming Railroad for use on its Marquette and Huron Mountain tourist line near Presque Isle. The 1904 vintage coach accommodates 62 passengers and has room for two old-time passenger car wood stoves. The seats are of old-fashioned plush and were transferred to the coach from former CR RR coach No. 51. Transfer of coach No. 60 (Stated as #50 in the article, but not correct), as it is listed, was effected from the roundhouse in Houghton to the Lake Superior and Ishpeming Railroad by way of the South Shore Line transfer at Houghton and the Soo Line. As far as is known, this is probably the first such trip this coach has made in its 60-year life, and its arrival in the Big Bay area marked the first visit of the coach to the Huron Mountain area. 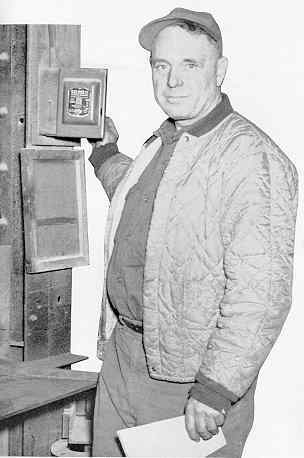 After devoting more than 47 years of service to the Copper Range Railroad, Charles S. Sincock reached the end of an active railroad career September 30. He retired as vice president - operations, a position he had held since 1959. Starting as a freight clerk in the Houghton yard March 20, 1927, Charlie, as he was affectionately known to all his associates, learned all phases of the operations. 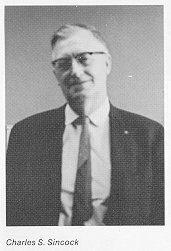 In 1946 he bacame superintendent of the line, served as assistant secretary of the corporation during 1958-59 and on June 18, 1959 was elected a director. He will continue in that capacity. Charlie Sincock experienced many changes during his 47 years of railroading on the Copper Range line. From a heavy schedule of freight and passenger trains during his earlier years, the business has now declined to the point where the CR Railroad has received from the Interstate Commerce Commission permission for abandonment. In recognition of his long years of loyal service, Charlie was presented a suitably engraved time-piece. The story appeared in Volume 9 Number 1, January 1969 issue. 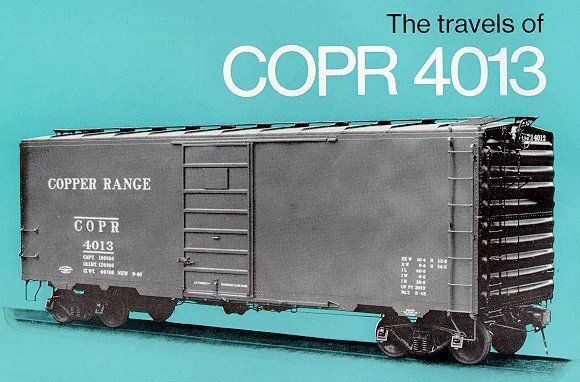 The photo shows COPR 4013 as it appeared from the Factory. It was painted in orange in 1964. When you have had to stop at a railroad crossing to let a freight train roll by, have you ever wondered why the train was made up of cars from so many different railroads? Perhaps by relating the recent itinerary of one typical Copper Range Railroad car, some light will be thrown on this subject. Before embarking upon such an armchair trip though, a bit of background information might add to its interest. Most general service cars, such as boxes, gondolas, hoppers and flat cars, are graded according to nine different classes as established by the Association of American Railroads. The classes are determined by the age and condition of the car. Users of another line's cars pay the owners the daily rates called for by the classes into which the cars fall. For example, a class 9 car is a new one with modern refinements and calls for a daily fee of $12.18. Cars belonging to the CRRR fall into class 1 or 2 and carry a use rate of $2.16 or $2.79 for a 24-hour period beginning at midnight. Tank or refrigerator cars, as well as others having special equipment, are paid for by the number of miles they travel, either loaded or empty. The rates the using railroads pay the owners are based on the type, age and value of the cars and vary from six-tenths of a cent to 9 cents a mile. Every time one railroad turns off-line cars over to the custody of another railroad, a report is mailed to the owners. Each railroad periodically sends a statement of all off-line, or foreign, carrs it has used to the owners. Then the owners draw bank drafts according to the amounts shown on the statements. If a car is in need of repairs during off-line use, the railroad using it has the repairs made at rates established by the AAR, and a draft is drawn to cover repair costs. The Copper Range Railroad has 32 off-line cars, which are crisscrossing various sections of the country most of the time. To issustrate just how there off-line cars are hauled about the country, the CRRR records received from user lines were examined. 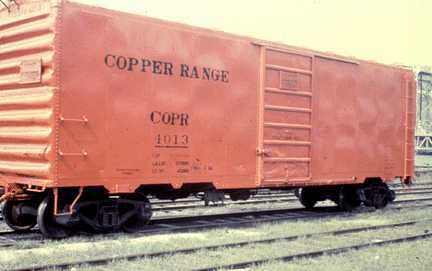 The car bearing the designation COPR 4013 (Copper Range) was selected as an example. The records revealed that this car, COPR 4013, was loaded with lumber at Twin Lakes, about 20 miles southwest of Houghton, last February for shipment to Goshen, Indiana. It rolled but a short distance on CR tracks. Then, COPR 4013 was transfered..
New York Central Feb. 22 Delmar, Ill.
Rock Island RR Mar. 21 Chicago, Ill.
Northern Pacific Mar. 23 Minneapolis, Minn.
Duluth, Messabe & Iron Range Apr. 30 Duluth, Minn.
Milwaukee Road May 10 Duluth, Minn.
Indian Harbor Belt June 3 Franklin Park, Ill.
Chesapeake & Ohio June 10 Indianapolis, Ind. Canadian Pacific June 12 Detroit, Mich.
Maine Central June 22 St. Johnsbury, Vt.
Canadian Pacific June 28 St. Johnsbury, Vt.
Chesapeake & Ohio July 6 Detroit, Mich.
Chicago & Northwestern July 9 Chicago, Ill.
Missouri Pacific July 13 Valley Junction, Ill.
National Railway of Mexico July 19 Laredo, Tex. So far as is known, COPR 4013 is still seeing service in Mexico. But some day 4013 will find its way back to the Copper Range Railroad yards in Houghton and , it is hoped, not much the worse for its travels. This story appeared in the August 1963, volume 3, number 8 issue. Old Atlantic Sands yield again. 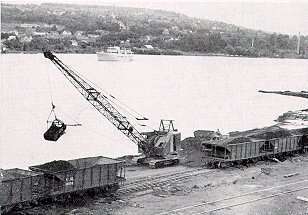 Shown here is the dragline hoisting stamp sands from the old Atlantic Mill site on Portage Lake to Copper Range Railroad cars for haulage to Freda Mill. In the background is the U.S. Park Service boat, Ranger III, on a trip to Isle Royale National Park. 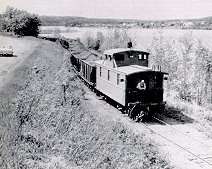 A trainload of Atlantic sands on their way to Freda Mill via the Copper Range Railroad. Conductor Harold Eilola sees where he's been from the platform, and Nels Swanson keeps track of the scenery from the caboose roof. For several years sands from the Atlantic and Baltic Mills at Redridge supplied a sufficient amount of copper to justify their being transported to Freda for processing. Lately, however, tests by CR assayist Richard Benbow show that these sands can no longer provide enough return for the effort necessary to extract the copper. 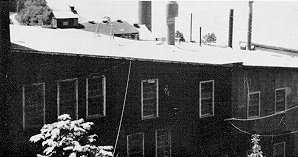 For this reason the company has turned to the sands left at the original Atlantic Mill site on the banks of Portage Lake, west of the Bosch Brewery. The Gregoire Construction Company of Lake Linden has contracted to load the Atlantic sands into railroad cars for shipment by rail to Freda Mill. About twenty rail cars are shipped daily, seven days a week. The mill is now operating on a 50-50 basis, half mine rock from Painesdale and half sands from the old mill sites. The reclaiming of these sands from the old Atlantic Mill site has a two-fold benefit. Primarily, of course, it gives the company a chance to continue full operations at Freda Mill. This helps meet the increasing demand for Lake Copper. Secondarily, but still important, the reclamation of these sands aids in the deepening and widening of the lake channel, which means easier navigation from the larger ships using it. Company officials keep a watchful eye on sampling results to determine whether or not the reclamation of Atlantic Mill site stamp sands is paying. Thus far, results look encouraging, This is evident throughout the mill and diggings as the men go about their work with zest in the hope that the mill will continue profitably for all concerned for many years. Appeared in the January 1964, Volume 4 Number 1 Issue. That December morn in the year '99. A five-man crew, all a-rarin' to go. "All aboard! Next stop is Winona Mine." And that was the start of the Copper Range line. A made-over freight car, a trailing caboose. But everybody cheered and yelled, "Turn her loose". Awaited the signal to give her the gun. The crowd became silent, and nobody stirred. Only the wheeze of the engine was heard. The train rolled and teetered with it, cried, "Comfort be hanged!" So over the hills and through valleys they sped. The train reached its peak at ten miles per hour. That day at the start of the Copper Range line. Filled with boulders and rottening logs. Teams sank to their withers in bottomless bogs. The road lay in shadow. No movement, no sound. And cold that could freeze dumb creature or man. Jammed that first train on the Copper Range line. Appeared in the August 1964, Volume 4 Number 7 Issue. More than 7,000 persons attended the dedication of the Twin Lakes State Park into the Michigan Park system. Highlighting the ceremony, held at the park in mid-July, was the presentation of a deed for 150 acres of CR land for the enlargement of the park and a brief history of the Twin Lakes recreational area by CR Vice President William P. Nicholls. The original 22-acre site was given by CR to Houghton County in February, 1928, with the provision in the deed that "the premises shall be used as a public park and playground and for no other purposes whatsoever". Several years ago, however, increased use of the facility brought the realization that fuller use could be made of the park if it were incorporated into the state park system. Negotiations between Copper Range and the Michigan State Conservation Department led to an exchange agreement whereby CR deeded 150 acres of land adjoining the smaller site to the state for use as a public park. The actual presentation was made by Mr. Nicholls in behalf of CR President, Dr. James Boyd to Glenn Gregg, Michigan Conservation Department Regional Manager, at the dedication ceremony. In his remarks, Mr. Nicholls stated that, "Copper Range Company has never posted its lands, and looks with favor on having its more than 300 square miles in the Upper Peninsula used for the recreation of the public." This story appeared in the December 1967, volume 7, number 12 issue. Raymond Durocher, master mechanic at Freda blows the siren at 7 a.m. Saturday, November 4, signalling the end of the shift.... the end of all shifts, ater 67 years of processing rock from Painesdale. 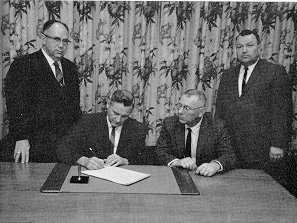 Signing the contract that makes official the turning over by Copper Range Co., the Champion Mine water supply to the Adams Townshop - Village of South Range Water and Sewage Authority which will henceforth furnish water to the Range area and much of the Portage Lake district. Seen from left are: William P. Nicholls, CR vice President; Ferris R. Dennis, chairman; Helmuth M. Steinhilb, secretary; and Clifford F. Paulson, Townshop supervisor and Village President. 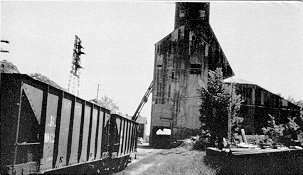 The last skipload of ore was removed from Champion Mine in Painesdale and loaded in cars for the trip to Freda, September 11. With copper-bearing rock so poor as to be unprofitable to extract, the mine had to be closed. Stillness settled over the Copper Range mill at Freda November 4th when it ceased operations. Built in 1900 Freda was the last to cloase of five stamp mills that had flourished in nearby lake shore towns since before the turn of the century. 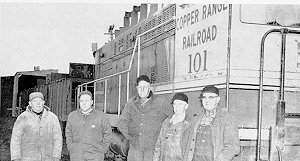 The last trip to Freda for the Copper Range Railroad was made November 3 to pick up cars used to haul the final shipments of stamp sands from Portage Lake the previous day. The train crew, from left, is: Carl Ponnikas, brakeman; Carl Wuoti, fireman; Gus Kumlin, brakeman; Eddie Laurn, engineer; and Cyril LaBissoniere, conductor. 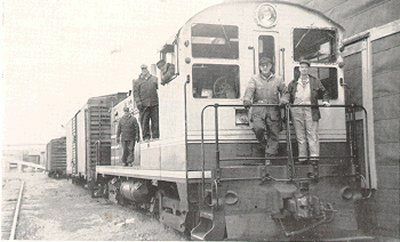 Switching at Dollar Bay, this train crew, from left, consists of Ralph Hurley and Harold Eilola, trainmen; Joe LaBelle, engineman; Cy LaBissoniere, conductor; and Brad Merrill, engineman.